I cringe when I hear the phrase “eating for 2”. Pregnancy is not a license to eat all of your guilty-pleasure foods as often as you want. Pregnancy is a time when you should be extra cautious of what you put in (and on) your body. You really only need an extra 300 calories in the second trimester and 500 calories in the third trimester, with no extra calories in the first trimester. Instead of focusing on doubling the amount of food you eat, you should be focusing on getting the most nutrient-dense foods possible. Doubling up on empty calories will only harm your baby. Because what a woman is exposed to during pregnancy through her diet and environment can prevent or cause disease in her child later in life. By changing the baby’s epigenome. Genes cannot be changed, but they can be turned on or off by your epigenome. Each cell in your body has the same genes, but not all of those genes are active in every cell. The cells in your eyes have no use for digestive enzymes (and would probably be harmed by them) so the genes that code for them are turned off in all of the cells in your eyes. Similarly, the genes that code for photoreceptors are only needed in your eyes and are thus turned off in all other cells of your body. How do your cells know which genes to turn on or off? That’s where your epigenome comes in. While your genome is your complete set of DNA, your epigenome is all of the chemical compounds that control your genes. By binding to or detaching from genes they can activate or deactivate them. Some genes are only active during specific periods of fetal development. Take for example the genes that code for eye development. These genes, and others, are active only during specific stages of fetal development, and then remain inactive for the rest of your life. Chemical compounds turn these genes off once they have served their function to prevent you from growing a third eye. And those genes are deactivated in the rest of your body cells right from the beginning to ensure that you don’t end up with eyes in the back of your head…or on your arms…or feet…you get the picture. So that is how your feet become feet and your heart becomes a heart and so on. Because your epigenome controls which genes are turned on or off in which body part. This is called differentiation. Without our epigenome, we’d all be undifferentiated aliens that are not only hideous to look at but unable to function in the world. Or even survive for that matter. The epigenome of a fetus or young baby can be altered by environmental chemicals in a way that increases disease susceptibility even in adulthood. This explains why seemingly healthy people can still end up having a heart attack or getting cancer. It was most likely programmed into their epigenome before or shortly after birth. This doesn’t mean that eating healthy, exercising, and avoiding toxic chemicals is pointless. An unhealthy lifestyle will only speed up disease progression and make recovery that much more difficult. More importantly, unlike genetic changes or mutations, epigenetic alterations are reversible. Research is showing that it is possible to make beneficial epigenetics alterations through diet and lifestyle. So you are not doomed if you didn’t get the best nutrition in the womb or during infancy; there is still hope of changing your fate. Maternal stress as well as early life experiences have been linked to epigenetics changes in babies that can increase susceptibility to mental health disorders later in life. That doesn’t mean that if you had a highly stressful pregnancy your child is doomed to become depressed or schizophrenic in adulthood. It just means that you need to be extra mindful of providing a warm and loving environment for your child to grow up in while avoiding exposure to toxins through food and environment. Remember, epigenetics changes are reversible. One of the most hopeful areas of research regarding the epigenome is the field of nutritional epigenetics. There is potential for chemopreventive agents such as phytochemicals in food to prevent genetic diseases when administered prenatally or during early infancy by influencing the epigenome. 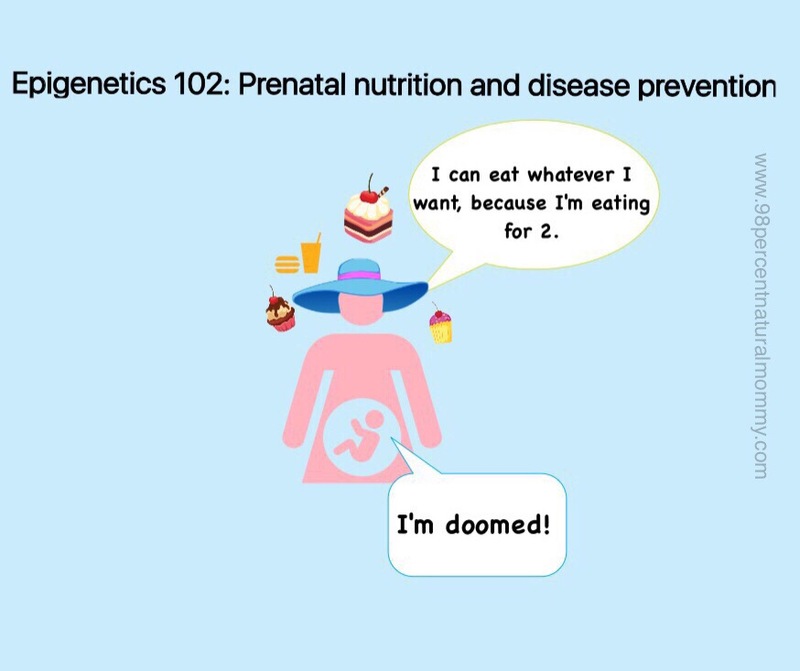 There is hope that even for babies who are genetically predisposed to disease, the right prenatal nutrition can alter their epigenome in a way that keeps those disease-causing genes inactive from infancy all the way through adulthood. So perhaps the prenatal vitamins of the future will create a generation of super-babies who are immune to disease. My journey to a healthier, clean lifestyle started when I was pregnant with my daughter. There is no greater motivation than the daunting reality that your diet and lifestyle choices are directly responsible for the lifelong health of your precious baby. For any of you that are pregnant or breastfeeding, please understand the importance of what you eat/drink and expose yourself to through personal care products, cleaning products, and your environment. You can either set your child up for a lifetime of good health or a lifetime of health struggles. Your child does not have a choice, but you do. Pregnancy is not a license to eat anything and everything. Make healthy choices now and your child will reap the benefits for a lifetime.